In your friendly neighborhood cast iron skillet, heat Oil over a medium heat. Once the skillet seems warm, add Red Peppers, Broccoli, Garbanzo Beans and Artichoke Hearts and gently mix them with a wooden spoon or spatula. Then add Lemon Peel and 1/2 Teaspoon Black Pepper. Stir occasionally and flip the Vegetables until they are tender. Once your Broccoli has darkened in color and is tender, stir in Lemon Juice, Parsley and Kalamata Olives. Let cook for about another 30 seconds to heat the Lemon Juice. 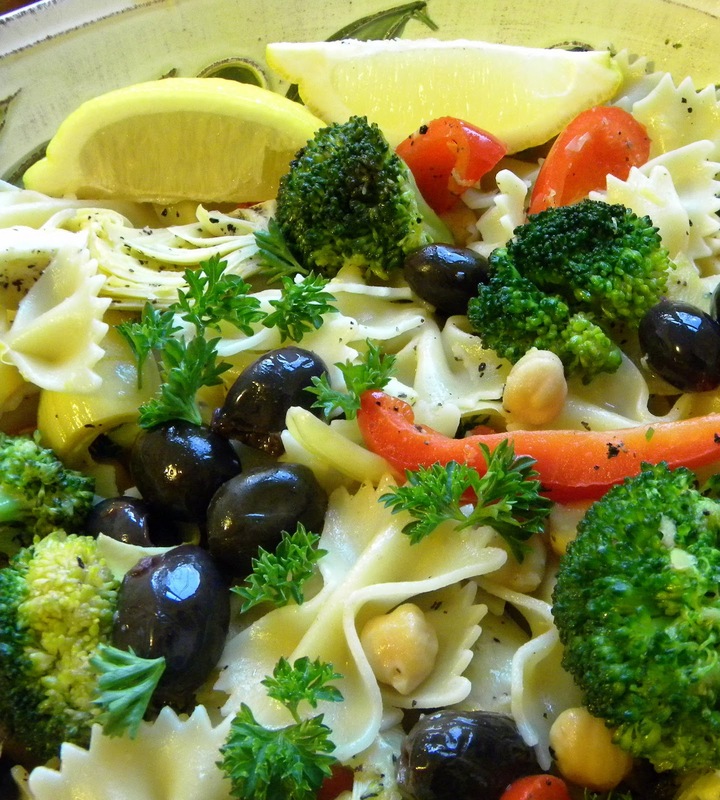 Then in a large bowl, toss the Lemon Vegetable mix with the cooked Pasta and eat! How would you say this would work with "buffalo style" artichokes? I buy the most deliciously flavored grilled artichokes from whole foods and I love the ones that are coated in a buffalo flavored sauce. Ya know - I don't know. It sounds like it would be pretty amazing to me. I'm actually a little jealous. I love artichoke hearts and those sound really delicious. This looks yummy! And healthy! Oh, and I got my VegNews package. Yea!!!! Thanks! They sent 6 ABC cookies! I love those, but I have to wait a week to dig. Damn. I'll take a pic and send it to you pronto! Oh my gosh, yum. Am trying this for sure!